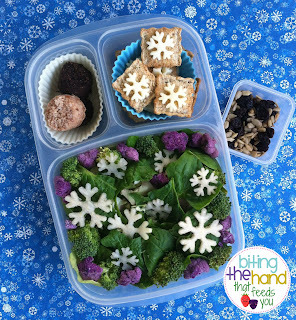 To celebrate the season, Bento Bloggers and Friends is doing a series of themed blog hops. This one is the first of four, and has a winter-y theme. Brrr! 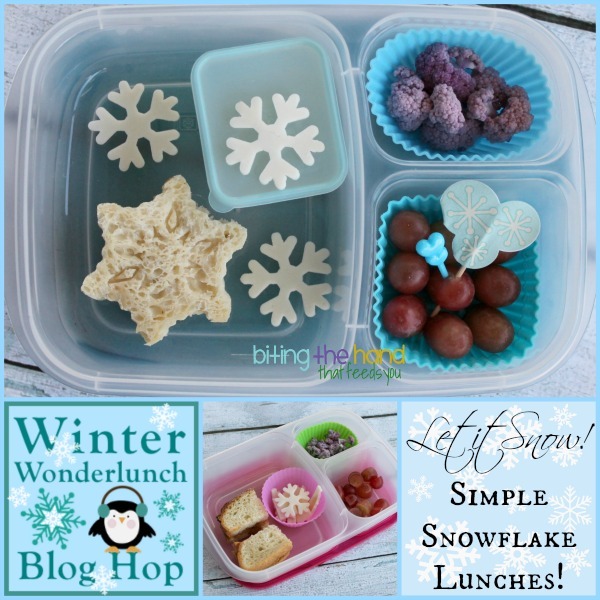 So after checking out my snowlicious lunches below, get your mittens and scarf, and head on over to Bent On Better Lunches to see her chilly lunch creation! I've found that the toddler and I are fine with goat milk, so I got some sliced goat cheese for when I'm feeling lazy. (ie: every day.) I used a snowflake fondant cutter to make a few cheesy snowflakes. Gluten-free bread is harder to work with in general, and doesn't hold a design as well, but I tried my snowflake cookie stamper on her sandwich anyway. It turned out okay. You can even see the design a bit! 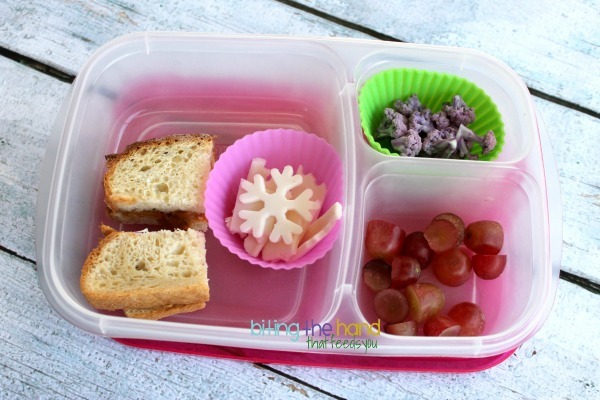 Since my goal was to try and include a heart in every lunch this school year, I added a heart pick to her grapes, along with a disposable snowflake design pick that came in a pack with paper cupcake liners too, on clearance a year or so ago at Target. Little E got the same purple-y fruit and veggie as Big Sis, only no Ranch, since she'll eat her cauliflower plain. And I was out of clean blue muffin cups, so I made her lunch brighter! I didn't bother making a snowflake sandwich for her, since she seldom eats the bread anyway. And she only got one cheese snowflake. The cheese scraps are tucked underneath. No waste! 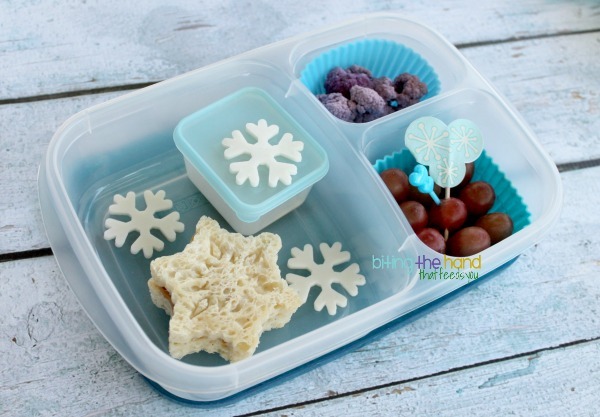 I've made several other Winter-y bento lunches, but these snowy ones are my favorites! Such pretty lunches! I want to get that small snowflake cutter. So pretty! I am having to restrain myself from running out to get a snowflake cutter! I have found that GF bread holds a pattern better if I toast it after pressing it. 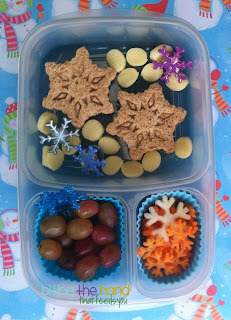 Love how the cheese snowflakes turned out! Those snowflakes are killing me. I NEED to own those cutters. Nicely done, Kendra! Such cuteness! Good job, Momma! Such a pretty lunch. I just love the winter blues - makes me want to go out and build a snowman - now if it would just snow! Love the pink lunch, too! LOVE that snowflake salad!! So pretty!